Happy Saturday friends. Hope everyone is having a wonderful weekend! 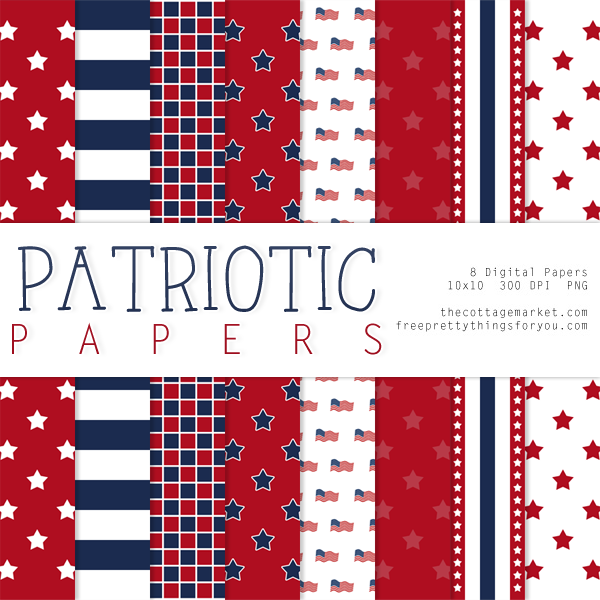 You know what happens on Saturday’s…it’s time for some more Digital Scrapbooking Freebies and this time it is an amazing Fourth of July Patriotic Digital Scrapbooking Pack! Just makes you want to sing from sea to shining sea, right?! You will find the second pack here at FPTFY and then all you have to do to get the other first half is click over to my place (The Cottage Market) and get the first half. I hope you enjoy! Click here to download part 2 directly! To download the first part visit me over at my place to download! Don’t forget to check out our other digital paper packs…we are going to continue to help you grow your collection and we will see you back here next Saturday for more Digital Paper Pack FUN! You can use these pretties for anything you would like…the only thing we ask is not to sell them as a digital pack…we are giving them to everyone so we don’t want anyone to have to pay for them : ) They are fabulous for scrapbooking, card making, paper crafting, web designs, creating banners, crafts. invitations and about a million other things! As long as you keep loving them…they will keep coming…so check back each week for you new pack! Collect them all. Enjoy your Paw Print digital Scrapbooking Paper Packs!!! Hi, lovely digital papers and thanks so much, but I think there’s a problem with the #2 link. It’s downloading the #1 paper set. The paper pack at both sites is part one. Here it is directly though! Thanks you for fixing the link. I love these papers. Thank you so much! I make card for family and friends every month for the patriotic holiday of the month. Cards have already been mailed for yesterday’s holiday, June 14th, Flag Day. I really appreciate these papers, patriotic paper is really hard to find. Thank you ever so much. Beautiful papers. Thank you so much! Just curious, though – why 10×10 instead of the standard 12×12? Thanks so very much for the freebies like this on your wonderful site! I’m very new to this hobby and am learning by myself. I just love it! I’ve discovered “layering”.